At one time, not all that long ago, clothes washers and dryers were relegated to the basement, garage or utility closet. Today, however, an increasing number of homeowners want a dedicated laundry room for washing, drying, folding and ironing clothes. There are many reasons why a dedicated laundry room makes sense, but the primary one is convenience. It’s simply easier to have the washer and dryer on the main floor of the house or on the second floor near the bedrooms. 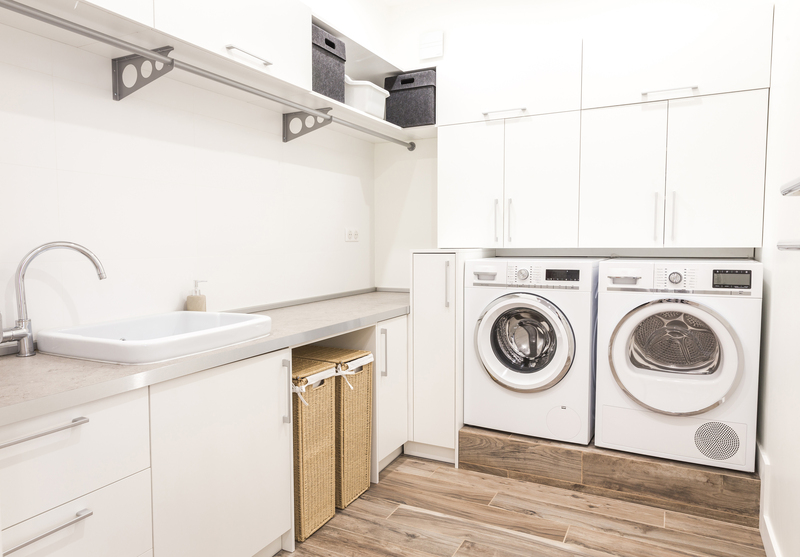 And modern laundry rooms are often equipped with racks for hanging up shirts, countertops for folding clothes, and cabinets for storing detergent and other laundry supplies. Some laundry rooms even provide enough space for setting up an ironing board or clothes steamer. Adding a laundry room to an existing home can be relatively easy and affordable, or complicated and expensive, depending on the layout of the house. 1 Doorway Clearance—The quickest and most affordable way to gain a new laundry room is to convert an existing room. However, be aware that you’ll probably need to enlarge the doorway opening to accept the washer and dryer. Most laundry appliances require at least 30 in. of clearance to fit through the door. 2 Duct Venting—Clothes dryers must be vented to the outdoors, so it’s best to position the dryer against an exterior wall. Then, you can vent the dryer right out the wall to the outdoors. And for optimum dryer performance and energy efficiency, keep the vent pipe as short and straight as possible. Also, use rigid metal vent pipes, not flexible plastic vents. Metal venting is more durable, easier to clean and highly fire resistant. 3 Plumbing Placement—As with any project that requires new water-supply lines, vents and drainpipes, it’s best to situate the laundry room as close as possible to a room that’s already plumbed. That’s why most laundry rooms are placed adjacent to a bathroom or kitchen, where it’s easy for the plumber to tap into existing pipes and drains. The farther away the laundry room is from your home’s existing plumbing system, the harder and more costly it will be to build. 4 Electrical Requirements—You’ll need to hire an electrician to provide power to the washer and dryer, so get an estimate for the work before establishing your budget. Also, consider adding a few extra wall outlets and perhaps even a TV cable box. 5 Prepare for Leaks—If you move the laundry room to the main floor or second floor and then a water hose bursts or the washing machine overflows, it can cause serious damage to the floors, walls and ceilings below. Fortunately there are products designed to protect against such leaks, including shut-off valves that stop the flow of water the instant they detect a leak, drain pans for placement underneath the washing machine, and moisture sensors that sound an audible alarm and send an alert to your smart phone should a leak occur. Check with your plumbing contractor for the best type of leak protection for your laundry room. 6 Flooring Options—The wet, dusty environment of a laundry room can wreck havoc on the floor. Porcelain tile is durable and easy to clean, but it doesn’t absorb sound very well and its grout joints are susceptible to cracking. Solid hardwood is a good option, but you’ll need to refinish it every few years. High-quality resilient sheet vinyl is relatively affordable, surprisingly tough, and seamless, so it’s impervious to spills, scrubbings and foot traffic. Other good options include a floating floor made of cork or plastic-laminate planks. 7 Utility Sink Upgrade—If space and budget allows, ask the plumber to install a small utility sink in the laundry room. It’ll provide a convenient place to presoak dirty clothes and to hand-wash delicate garments. Some utility sinks even have a built-in washboard for scrubbing out stubborn stains. 8 Proper Lighting—Bright, shadow-free lighting is important to create a safe, efficient working space, especially if the laundry room will be used for sorting, ironing, and folding clothes. The average-size laundry room should have at least one large ceiling fixture or four to six recessed lights. And if the room has wall-mounted cabinets, consider installing under-cabinet task lighting, too. 9 Lock Up the Cabinets—Most detergents and cleaning supplies are toxic to kids and pets. It’s important to install childproof locks on the cabinet doors. And keep all drawers free of anything that’s even remotely dangerous or poisonous. 10 Upgrade Appliances—Building a new laundry room is the perfect time to replace your old washer and dryer. There are dozens of models available, so you’re sure to find ones to suit your budget and family. And remember that you can often save a significant amount of money by purchasing a paired set. If space is tight, consider a stackable washer/dryer, or even an all-in-one model that’s a combination washer/dryer in one unit. Learn more about tools that can help you maintain your laundry room by clicking HERE.